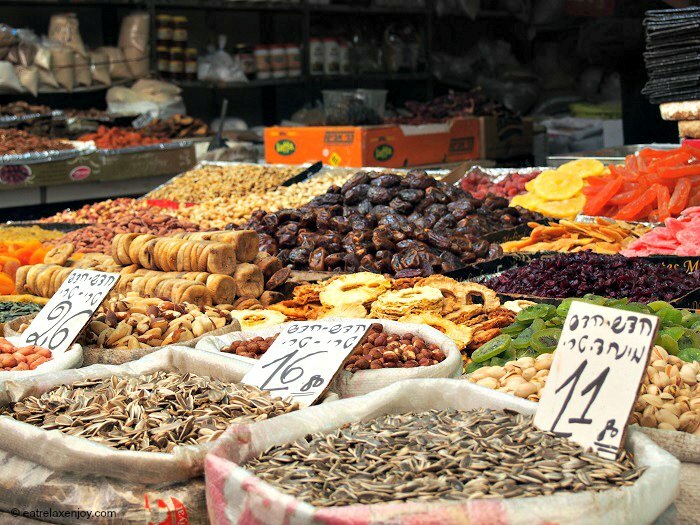 Tu BiShvat in Jerusalem will be celebrated this year with tours, planting, music and culinary. 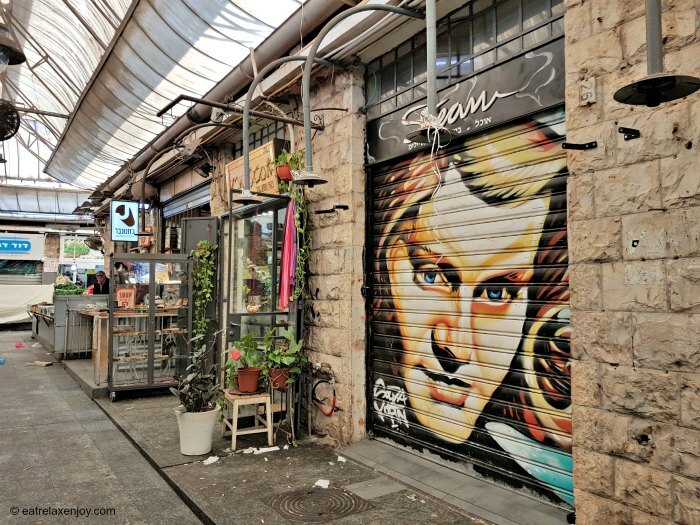 We went to Mahne Yehuda market with Chen Koren on a culinary market tour for Tu BiShvat and visited the Jewish Music Museum, where guided musical tours will take place with the holiday spirit. The museum just opened a new kosher dairy restaurant. Chen and Alon Koren became famous when they attended the Israeli culinary reality show in Channel 2. They used to live in a little apartment in the market, and know it from the inside out. They know the market stands, restaurants, people, and stories. They bring people to the market to experience its hidden corners, people, smells and tastes. 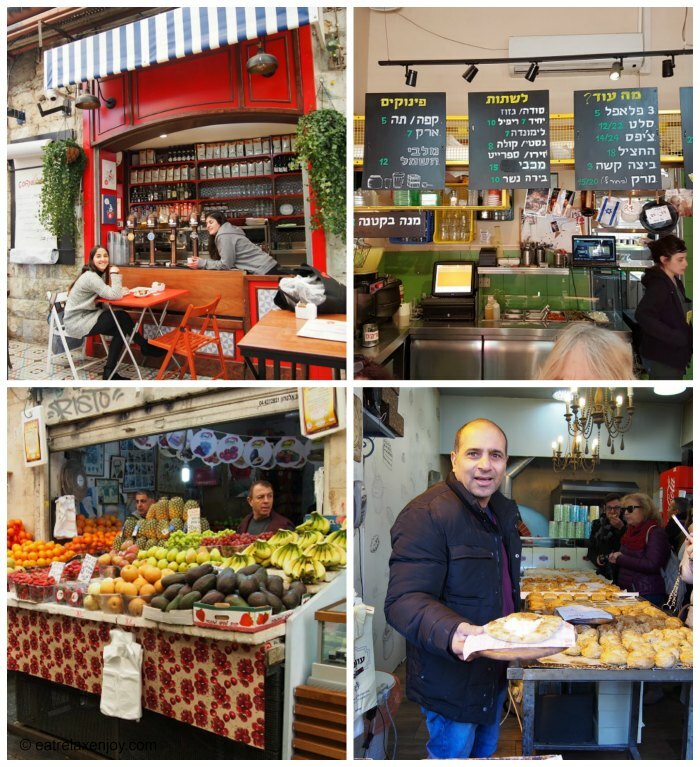 We went with Chen to the Mahne Yehuda market on a cool Sunday morning. The sleepy market just started to wake up. We had a chance to see the beautiful graffiti on the closed stores’ shutters. We started walking among the stands of fruits, vegetables, bread, halva, etc. 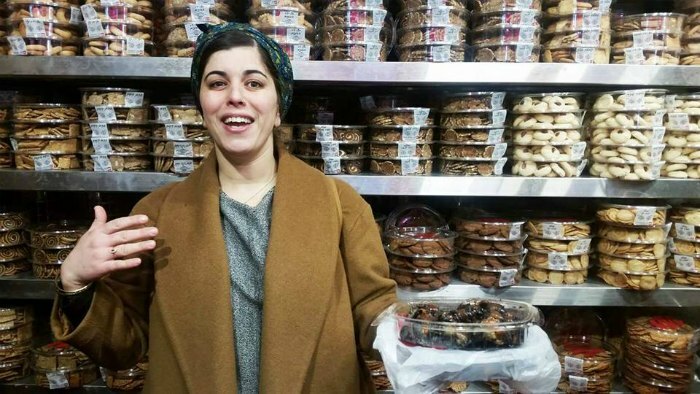 and of course – for Tu BishVat – to the dried fruit stand. We entered a bakery to taste chocolate “rogale” (sweet pastry) full with chocolate, a specialty of that bakery. From there we went to Uzi-Eli, the citron man. The stand serves fruit shakes, but the real action goes behind the scenes, inside the little store. 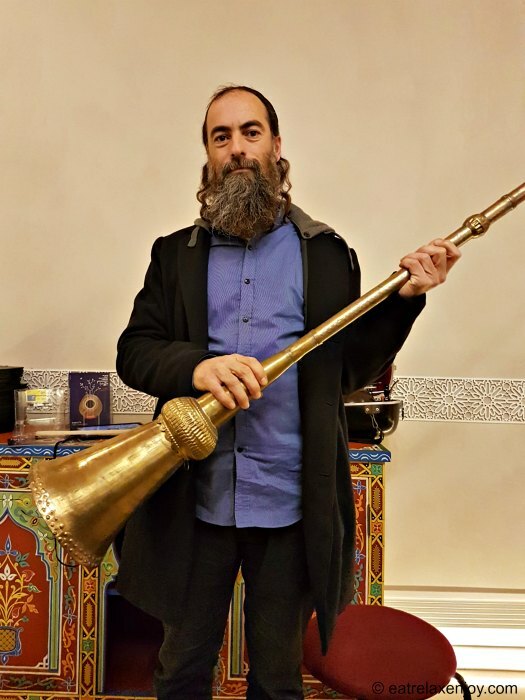 Uzi-Eli is well-known in Israel for his expertise in herbs and natural medicine, a knowledge that is passed in his families from generation to generation. He makes natural medications to many problems, which are sold in the little store. If you’re lucky enough, he’ll be around when you visit the store, he is a very interesting and ‘colorful’ person. His son runs the store now, as he is quite old. Another stand we stopped at was the Chaczapuri stand, this business is run by a family from Georgia, and we tasted their traditional Chaczapuri. We continued to Basher’s deli. Basher’s family had a restaurant, but Basher “fell in love” with cheeses when he was in France. He came back and opened a deli. The deli carries many cheeses and wines. We tasted there Gruyere cheese, aged 30 months (my favorite cheese, I always bring it from Switzerland), and toasts with Truffle butter, dried tomatoes, and Parmesan – to die for! Before the end of the tour (not before we stopped in a number of places) we crossed the street to Arbes hummus shop. Here are a few more photos from the market tour. 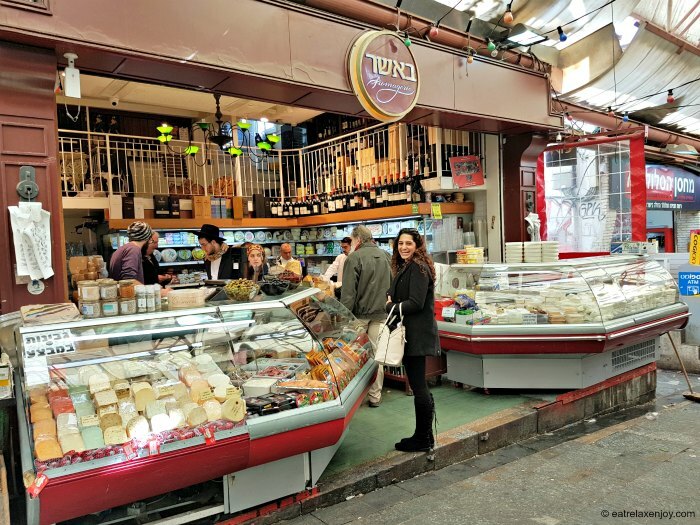 Chen and Alon’s culinary market tours are offered stand alone. They include a tour, meeting interesting people in the market, and food tasting. They are about 3 hours long and cost 250 nis per person in a group of at least 10 people. In addition, they offer cooking classes that combine a visit to the market to buy groceries and then cooking them together. 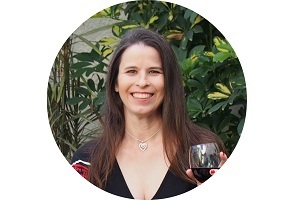 The classes can include Italian, Jerusalem, South African food, desserts, etc. Prices range from 350 nis. Chen and Alon’s house is open on weekends for guests. They have a traditional Shabbas dinner with prayers, songs, and talks around the Israeli and Jewish culture. Price is 300 nis per person in groups of up to 40 people. The activities are offered in Hebrew and English. The museum of Jewish Music will offer musical tours in the spirit of Tu BiShvat that will be guided by a musical artist. 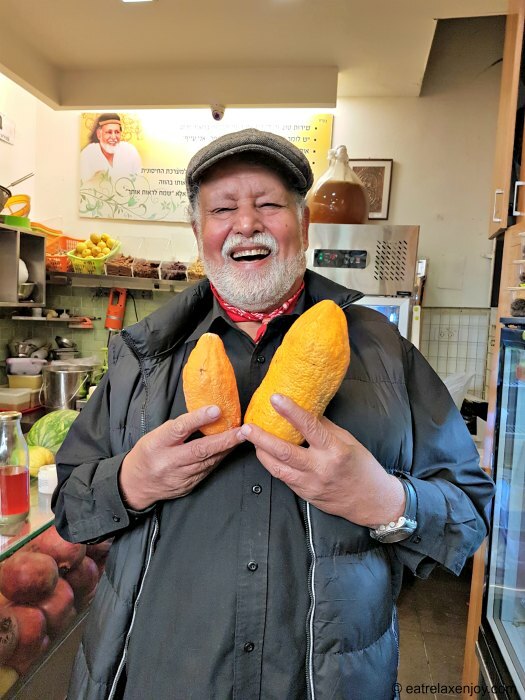 The tour will include a visit to the museum, a demonstration of unique musical tools, playing and singing of “Shirat Haaretz”, songs about Israel’s harvest, fruits and vegetables. In Tu BiShvat it is a custom to have a special meal “Seder Tu BiShvat” that includes singing the special songs of the holiday. A tradition that is less popular these days. These tours are an opportunity to go to back to tradition in a unique atmosphere. 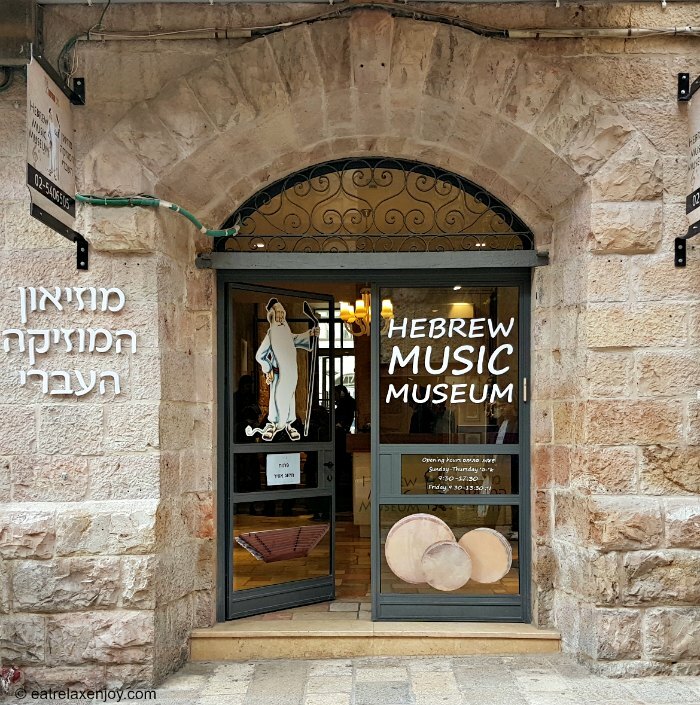 The museum of Jewish music is a beautiful little museum located on Yoel Moshe Solomon alley. The museum exhibits 260 musical instruments, some unique, and many constructed especially for the museum, that displays musical instruments from all around the world. The museum tour is guided by a Tablet, available in Hebrew, English, French, Spanish, Russian and more. It takes the visitors to the different museum rooms and tells them about the area, the instruments, and plays their sounds. Perhaps the most unique attraction in the museum is a virtual reality model of the Jewish Temple where the sounds of the music of the temple are played. The museum of Jewish Music is located in “Kikar Hamusica”, a beautiful complex containing the museum, a plaza for open shows, kosher restaurants and soon to be opened concert hall. There is a plan to open here a music school and a hotel. Laurent Levy, a French-Jewish who made aliya and relocated to Israel is the owner, who initiated this project to spread music and good to the Jewish people and the world. One of the newer restaurants here is Nahman, a kosher dairy restaurant. 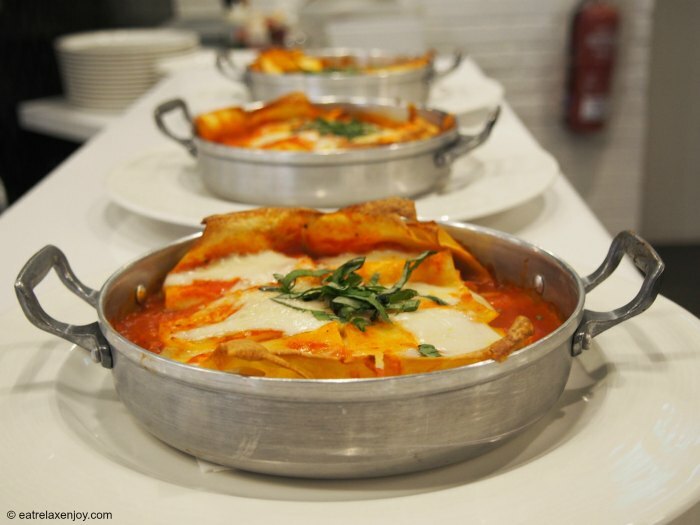 Nahman serves kosher dairy food combining French and Italian food. The restaurant is called Nahman after the alley leading to the plaza of “Kikar Hamusica”. The restaurant’s décor is modern black and white. At the center of the restaurant stands a big Italian Pizza oven. You can look at the preparation of the pizzas and see them coming out of the oven. We shared a number of courses. 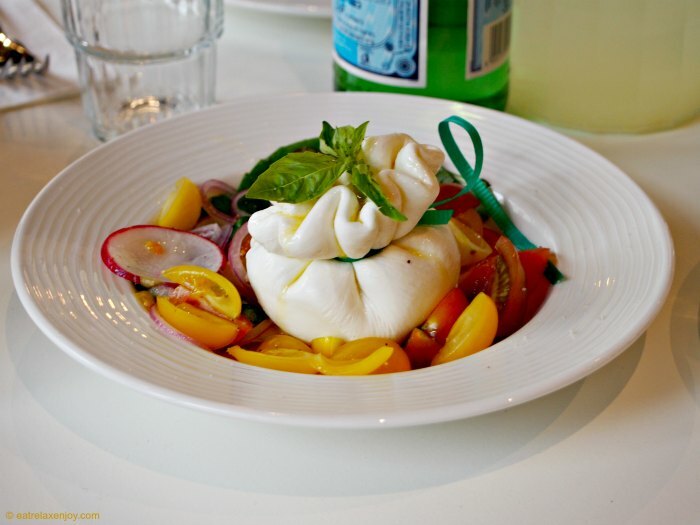 Salads: Green salad, vegetables Antipasti, Mozzarella cheese shaped like a bag with cherry tomatoes. All tasty. I loved the mozzarella bag which was a celebration to the eyes and mouth. Starters: Margarita and Mediterranean Pizza, Arancini. The pizza tasted well but was somewhat wet because of the fresh tomato sauce, which affected the texture of the pizza. The Arancini was wonderful! Main courses: Salmon, Cheese and Eggplant Lasagna, and pasta pane with cream and goats cheese. The salmon was juicy and soft, I enjoyed the lasagna but the pana was somewhat tasteless. 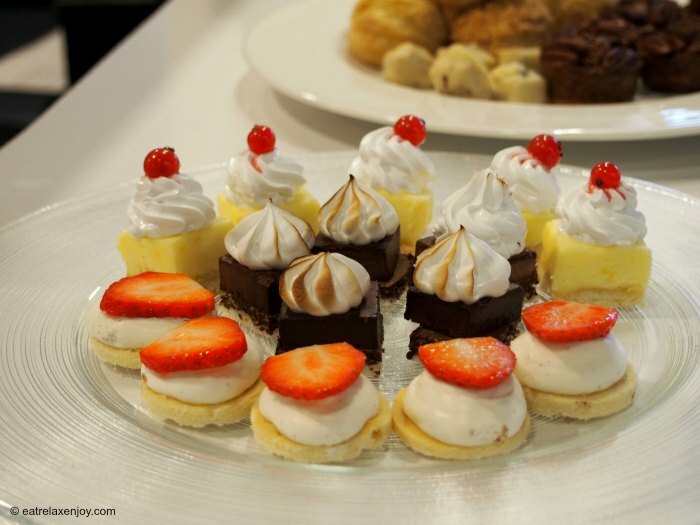 Desserts: a variety of desserts, including lemon pie, cream puff, dark chocolate truffles, and more petit fours. Everything was excellent, I especially loved the cream puff – the crème was fantastic! We also had one of the restaurant’s pound cakes with almond and cinnamon which was excellent.